The sentence game is not FIFO. The strange odiferous cloud made a great cape, but unfortunately also attracted donkeys. 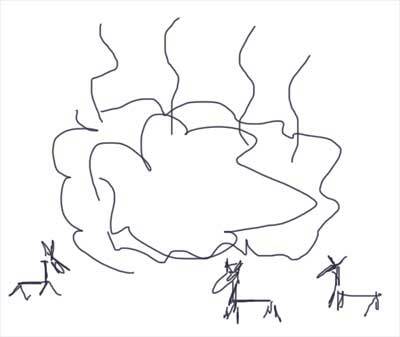 Three donkeys silently shared their last moment on earth as the meteor mercilessly crashed down on them from above. When the fenced asteroid entered the wormhole, the same horse three times over dined on Soylent Green. Haha! A rip in spacetime! Soylent Green! Aw, hell, sorry about that. I must have chosen the wrong drawing to upload. I had a great one for this sentence, too! Sorry about the meteor not being "giant", I ran out of room in the picture! Also the sentence game isn't first in first out, I'd noticed that too! I was wondering about that Betgognen -- though I figured it was a mistaken picture. It's "on the list" to add a submission preview to the game so that mistakes are harder to make. Yes, it's not FIFO -- the games to play are selected randomly from the currently active games. (so, I guess theoretically, it would be (minutely) possible for a game to never end). It's also "on the list" to make the game selection algorithm favor older games.